Get 1 Adhese Universal VivaPen system kit FREE! Esthetic cementation made simple. A light and dual-curing luting composite for the esthetic and permanent cementation of demanding ceramic and composite resin restorations. Its combination of exceptional esthetics and user-friendly shade matching ensures excellent clinical results in every case. 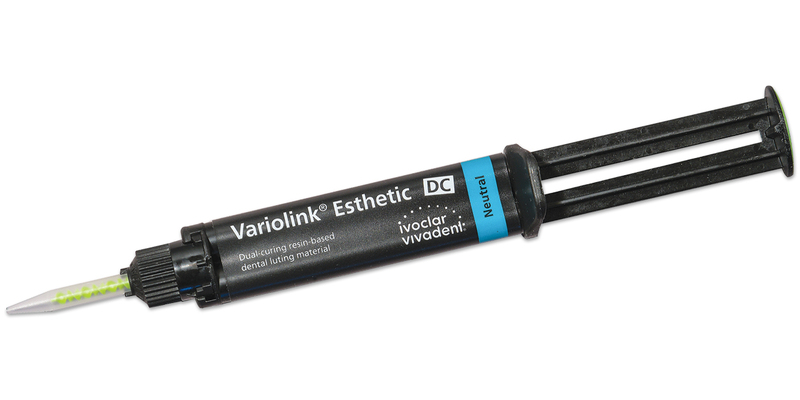 Even when exposed to intensive light or a humid environment, Variolink Esthetic is not subject to visible shade changes. Its lifelike fluorescence is similar to that of natural teeth. Very resistant to wear, ensuring good marginal quality of the restoration while in place. Accessories: 30 VivaPen brush cannulas, 20 mixing tips, 20 VivaPen protective sleeves, 1 brush holder, 50 soft brushes. Contains: 1 x 5g syringe, 10 mixing tips. Contains: 1 x 9g syringe, 15 mixing tips. Contains: 1 x 2g syringe, 5 applicator tips.